An Albany, Ga., church reaches out to the millions of Haiti earthquake victims still suffering from the effects of the devastating 7.0 quake in January. 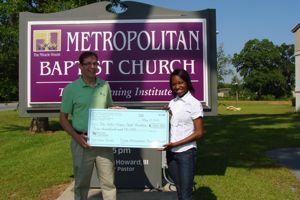 Dance ministries at the Metropolitan Baptist Church presented a $500 check to The Fuller Center for Housing, an international Christian housing ministry. The money will be used to help build houses for Haitians. Praise dancer, Joshlyn Hart says that tragedy could have happened in Albany and that’s why she helped. “It could have been us not having anything so we should give to them to let Haiti know we still care for them even though the disaster happened months ago,” said Hart. The Haiti earthquake killed an estimated 230,000 people and affected nearly three million.